Last week I was having problems with my digestion, so I stopped eating for a few days. The kind folks at Hospice were alarmed, and sent over a sack filled with different kinds of nutritional “foods” that are designed to keep the life-force strong. Hospice had the very best of intentions, and I am grateful for their concern. Although I do not wish to malign them in any way, the stuff they sent over was not real FOOD. In fact, I’m outraged at the idea that they feed this stuff to dying people. 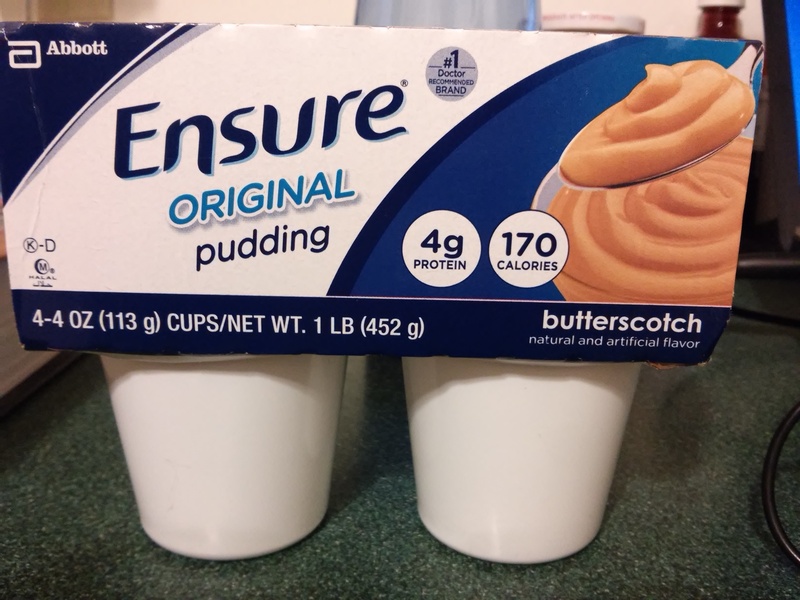 The first three ingredients in the so-called “pudding” are water, sugar, and corn maltodextrin (a heavily processed starch with a high glycemic index). Yum, yum. 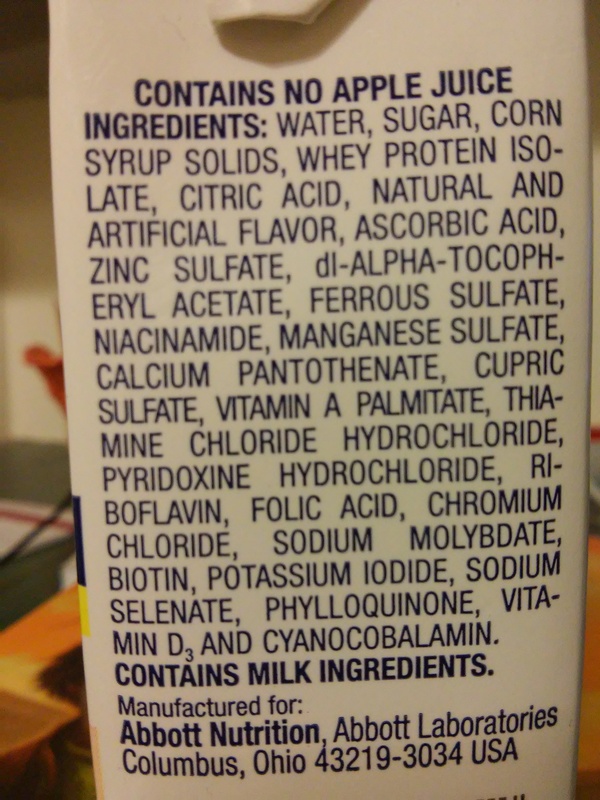 Moving on to the ersatz “shake,” the first three ingredients are water, corn maltodextrin (again) and sugar. And as for the alleged nutritional apple-flavored “juice” (which bears the warning “Contains no apple juice”), the main ingredients are water, sugar, and corn syrup solids. For the sake of comparison, a Milky Way candy bar contains 37 grams of total carbohydrate. The fake “juice” contains 43 grams of total carb, which makes it significantly sweeter than the candy bar. But wait: the “shake” contains a whopping 52 grams. The “pudding” wins the carb battle with a moderate 30 grams, which is approximately the carb equivalent of three-and-a-half Oreo cookies. What the hell is going on here? Why is this stuff being pawned off on the ill and elderly? For that matter, why is the worst food in town found at the hospital, where they dole out high-sodium, high-carb, high-junk-ingredient glop to patients and guests? I understand that our local city hospital is now part of a corporate empire, which by appearances is so concerned with making a profit that the emergency room is now completely devoid of old magazines to page through while waiting. I understand profit and loss. And yet, why is a place that’s supposedly dedicated to saving people’s lives, and restoring health, apparently in partnership with the sugary-fake-foodstuff manufacturers? It takes very little money to make the best therapeutic comfort-food possible, the same food that has nourished sick people for thousands of years, a nutritious foodstuff that lacks known allergens and causes no sensitivities. I’m talking about chicken broth, which is as easy to make as a salad (just more time-intensive). Instead of pushing these egregious false “foods” upon ill people, the hospital would be well advised to have someone come in two or three times a week and simmer 30 gallons or so of chicken broth. (And a pot of veggie broth too, for our vegetarian/vegan friends.) I make broth at home all the time. And despite feeling wobbly, I even made some three days ago when my own supply of frozen two-cup servings ran low. Soup is good food. Pudding can be good food too, if it has real milk and egg in it. Shakes can even be good (ice cream is, after all, quite nutritious.) And juice is good, assuming that it actually contains real juice. But this swill (I don’t know what other word to call it) from Hospice is completely vile. It’s not real food, only a collection of starches, sugars, artificial flavors and nutritional powders all mixed into water. Maybe someone who spends their life eating at fast-food joints wouldn’t object to eating Ensure products, but I do, because I know the difference between real food and fake food. I wouldn’t feed this stuff to a dying animal, let alone a dying human being. If you agree, let the hospital management know. Or snipe at them via social media until they begin to pay attention. I think it’s time for a food fight! Oh horrors, Carrol. The hospital absolutely needs to be shamed. This is despicable. Yes, chicken broth, vegetable broths: these are time honored and efficacious health elixirs. We in Bloomington know our food, and I’m so glad that you have outlined in loathsome detail (with pictures!) the corporate swill purveyed to the neediest hungry. I’m beginning my next round of sharing your post. I don’t understand how it’s gotten so bad. Regular folks such as you, continue to lead the nutritionists and academics (from whence the nutritionists come) toward real food and the understanding that eating is a personal process. Don’t get me started on academics and the egregious agricultural and husbandry practices that exacerbate our sick bellies. The nutrition industry wants to exclude those who would help people monitor their personal food-eating adventures, and yet nutritionists don’t deserve to do that. The dietician/nutritionist industry fails, where THE PEOPLE continue to transform in a good way, our food culture. Rah Rah, Carrol! That’s what I say, Rah Rah, Carrol. I would guess that it’s gotten this bad because nobody bothers to step up and say “Wait, this isn’t right.” Call me a rabble-rouser, but at this point in my life I see little benefit to being polite and demure. I did not realize all these really bad things that are all out there. I agree broths are a wonderful treat and a great way of getting some good taste. Ugh. Sorry you were confronted with that on a bad stomach. It reminds me of Emily’s complaint this morning. Her IU dorm breakfast of coffee, cottage cheese and a fresh fruit cup cost half of her allocated food points for the day. If she’d bought a “breakfast sandwich” with processed, fried sausage, reconstituted eggs and a fried biscuit, it would be much cheaper. We are being penalized for wanting real food! Dear Kay, that sounds delicious, but I can’t handle the yogurt (casein intolerance). Sure wish I could have some! I can almost taste it from here….yum! As someone who is in the “real” food industry I feel your pain. Should I send you some bone broth? Thank you, Chessley, but I have plenty of broth on hand now! It’s something that everyone ought to know how to make. Am half tempted to post my recipe at the end of the blog. You are right of course. However, people do survive on this swill. These “food substitutes” do have all the nutrients needed for survival. While chicken broth is nourishing and has elements not present in the food substitutes is is not a complete food. I am not a nutritionist but I don’t believe it contains enough protein to be considered complete. There are great strides to be made in the area of nutrition for the sick in this country. Meanwhile we have this “survival food” (swill) ready to eat with a long shelf life. I hope you can get some nourishing real food, prepared with love. Some might prefer Soylent (https://www.soylent.com/), but I will always opt for real food! Thanks for writing. The claim that one can subsist on Ensure but *not* chicken broth (or bone broth) is spurious but I understand why one would suppose this. The ‘complete’ food claim is what is called ‘special pleading’ and it is a logical (and scientific) fallacy. There is so much more in real food than manufactured ‘vile glop’ than can be tracked and measured to make such a claim (one way or the other). For example, just to begin with) my idea of chicken broth differs from Carrol Krause’s no doubt (I think hers is better already) just because recipes vary. But the creation of a concentrated nutritional broth for those with weak stomachs is key and using real food to feed real people, ill or elderly, had a lot of established medical support up until as late as the sixites. Then things changed and that was not because chicken broth, say, lacked protein by comparison with Ensure as you suggest — though if you think it does, add an egg as the Italians already do and you’ll be 7 grams of protein on top of what is already there, add two and you’ve covered for a meal (because if one assumes a 45 gram daily requirement for women, on average, this does not mean in a single meal) but if you’ve made the broth the old fashioned way (and somehow I, a New Yorker, have this fantasy that Bloomington must be a place where one makes real broth by starting with a real chicken rather than a can — although even the can starts with chickens) it will have an astounding array of nutrients and a considerable amount of protein. And more important still, and I think this was part of Carrol’s point, more assimilable, accessible nutrients including protein. The real ease of Ensure is that it is sweet — and thin: so very non-substantive that folks who are not well.will take it if an aide hands it to them. Plus there is the belief that if it is manufactured for a purpose it must suit that purpose. But the standards are hardly high and the data is stacked. And the disrespect for those who are ill and for older people, especially the very elderly is built into such things as they are supposed, in a telling phrase, to be ‘good enough.’ for folks in such circumstances. What Ensure and other such products really serve is the ease of the caregiver. Well said, Babette! You said it far better than I could have done. I sympathize. The hospice tried to foist that crap off on my mother back in 2005 when she was reaching the end and not interested in eating anymore. You’re more than right too about good old-fashioned chicken broth, easy to eat, good for you, comforting, delightful to smell and taste. easy to make. Vegetable broth is good too, even beef broth isn’t too hard to make. We’ve been flimflammed that those “nutritional” things actually are reasonable nutrition. I think I’d rather just be hungry instead of being stuck with that poor excuse – by the way, it tastes like chemicals. I know, the taste is appalling. It might be “edible”, but to me, it will never be food. The same was sent to Anne. She never consumed any of it. Actually the broth made from a traditional chicken breed versus the modern broiler cross could potentially be even more nourishing and tasty. I say potentially here because the birds I use are sexually mature male birds which have a whole spectrum of additional proteins in their bone and connective tissues, that is simply not found in a 6 week old bird. I am not sure if that is a good thing or not. Also there just is not much fat in the broth that is made form these birds but the complex carbohydrate cogent is high. Let me know if you want some and I will drop it off. I have some in the freezer and could easily make some fresh since I am culling this weekend. What would you like it spiced with? Funny that you should mention Ensure. I despised the stuff last year when doctors and nurses at Bloomington Hospital foisted it on me, and the same thing happened this week when a well-meaning nurse at IMA went to get some for me, but came back only with coupons, good for a multi-pack. The stuff always made me sick at my stomach. Needless to say, I’m not using the coupons. I was afraid to read the ingredients! I apparently came down with another incidence of C-diff and have had trouble eating. Some Campbell’s minestrone in the cupboard sounded good, but it was so salty, it burned my tongue. I look forward to a chicken pot pie that’s cooking in my toaster oven. Keep givin’ ’em hell, Carrol! Thanks, Bob! Campbell’s is too salty for me as well. My own homemade broth is the greatest; I keep it frozen in 2-cup portions for when I need it. Hope you feel better real soon! EXCELLENT POST!! As a nurse I can tell you these drinks are manufactured by the same wonderful people who make all your harmful drugs and are poisoning 3rd world countries. The manufacturers of these drinks call on the doctors office and give them “incentives” to prescribe their crap. When did this boxed junk replace food? Hi, I was reading your post about the right to die with dignity and Oregon does have that set up. I watched a story on the news about a lady that moved there when she found out she had brain cancer. She did chose to end her life. Thank you for this post! I completely agree. I teach a Human Biology course at IU that emphasizes human health starts with societal systems for healthy food, water, energy, etc. Turns out that hospitals are starting to catch on to the ‘farm to table’ movement, and some are even starting their own farms (check out: https://www.youtube.com/watch?v=_rjz-Kft4vo). The course is a service-learning course, and I am very excited about approaching Bloomington Hospital and perhaps even Hospice about service-learning opportunities with them in researching and ultimately helping to implement local, sustainably-grown food (I realize this is not something that will happen fast, but involving students to educate is a start). So I will definitely follow up. Thank you again for what are always wonderfully written pieces that help move the world in better directions. Peace. You are one of my heroes. Thanks so much, Heather! I happen to think that you’re fairly darned heroic yourself! 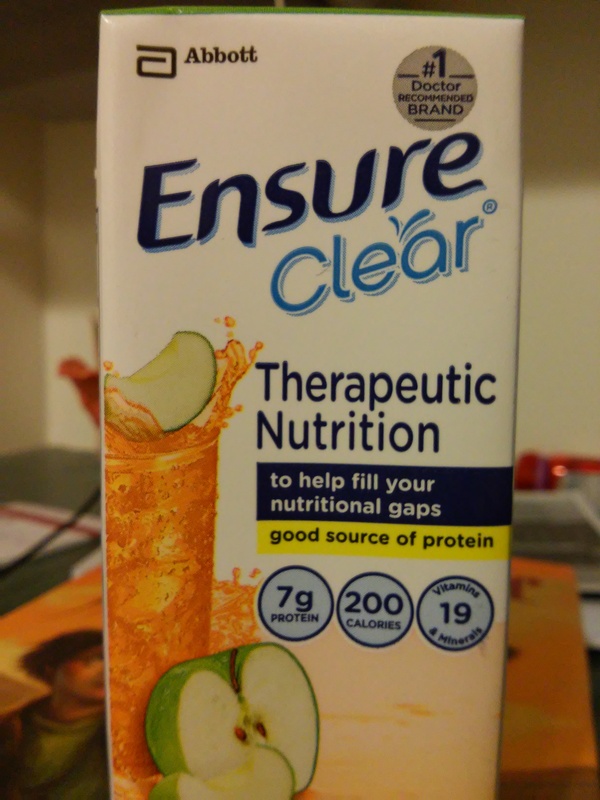 I’ve been thinking about this hospital & food issue ever since a friend who used to work at Hospice informed me that they distribute those nasty Ensure products because those products are donated to them by the company. If the hospital was willing to accept donations, then might it be possible to get a couple of volunteers to show up twice a week at the hospital cafeteria and prepare some big soup-pots of chicken and vegetable broth, which could be de-fatted after chilling and then frozen until requested by patients? It’s worth asking whether their kitchen is set up for “real” food prep. Fabulous proposition! Oddly, it is completely possible to economically serve real food. Food prep folks just develop a different skill set. Again, I am so happy that the wisdom of non-nutritionists is spreading far and wide. Go, Heather! and thanks again, Carrol. Still trying to think of ways for you to get true nourishment. What about Googling “The Weston Price Foundation” and seeing if they have any local chapters in your area? You can connect with the members and maybe find volunteers that’ll bring you bone broth/chicken broth, raw milk and other nutrient dense foods that they believe in. Still sending prayers! Last one I promise!! (Unless you want more ideas 😉 )The search came from The Big Bang Theory.. “Warm kitty soft kitty, little ball of fur, happy kitty purr purr purr” that we found cat purring on Youtube and mend&healing.com 26 hz tissue regeneration for the cat purring. You can try listening to that while you rest too.